COMPANY PROFILE Agricultural Bank of China Ltd is a state-owned specialised bank. The company provides corporate and retail banking products and services, and carries out treasury operations from more than 20,000 branches in China. ABC evolved from a state-owned specialized bank to a state-owned commercial bank, and later a state-controlled commercial bank. It listed on the Hong Kong and Shanghai Stock Exchanges in 2010. Headquartered in Beijing, ABC operates a 23,682-branch network in China, providing corporate and retail banking products and services, and carries out treasury operations for its own accounts or for its customers. Shareholders Central Huijin, China’s state-owned investment company, and the Ministry of Finance own 40% and 39%, respectively. 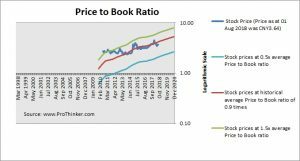 At the price of CNY3.64 as at 01 Aug 2018, Agricultural Bank Of China Ltd is trading at a Price to Book Ratio of 0.8 times current book value. 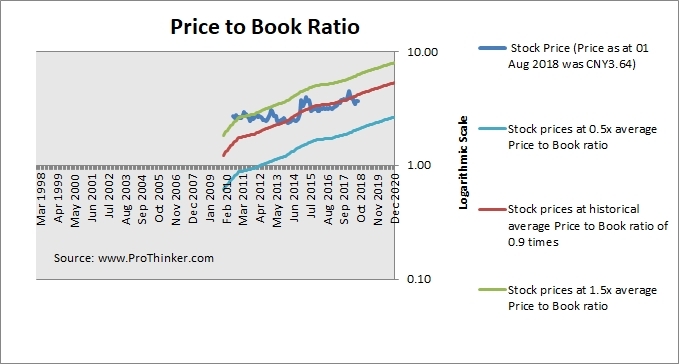 This is a 8% discount to its historical average Price to Book Ratio of 0.9 times.